Never thought we’d get there, huh? As I said earlier, ISO, shutter speed, and aperture work together as part of the “exposure triangle.” Any change to one of these affects at least one of the others. If, for example, you change the ISO from 100 to 200, your camera needs half as much light to make an image. If you do not change your shutter speed and aperture, the picture will be overexposed. If the shutter speed is 1/200 of a second and the aperture is f/5.6, you could change either the shutter speed to 1/400 or the aperture to f/8 to compensate. Typically, you will not change your ISO that often. You will usually set that just once, based on your conditions. 100 (or your camera’s lowest setting) for shooting in daylight or using flash, 400 to 800 (or higher) indoors and at night. With your ISO set, you will then use aperture and shutter speed to control exposure. Depending on what you are shooting, you will probably use one to control the look of the photograph and then adjust the other to maintain the correct exposure. Aperture is one of the main creative tools of photographers because it also controls something called depth of field. This is just a fancy term for how far behind your subject that things are still in focus. A large aperture (small number) like f/2.8 has a very shallow depth of field, which means that the background will be out of focus. This is often very desirable because it concentrates the attention onto your subject and eliminates distractions. A small aperture (big number) like f/22 has a very deep depth of field, so that everything behind your subject is in focus, all the way out to Mars. This is important for things like landscape or architectural photography. If you want to shoot with a wide-open aperture in bright sunlight, you definitely want to keep your ISO as low as possible. Even with an ISO of 100, you may need to shoot with a very fast shutter speed with an aperture like f/2.8. With a larger aperture, like the f/1.2 you might be able to get with an expensive portrait lens, your camera’s fastest shutter speed might not be fast enough. Shutter speed controls how the camera captures motion. A fast shutter speed stops motion while a slower shutter speed allows motion to blur. Obviously, you would probably want to freeze the action shooting sports or some other fast-paced activity. For this kind of photography, a shutter speed of around 1/400 of a second or faster would be ideal. ISO 100 f/9 @ 1/8 sec. There are times when you want to capture a sense of motion. Shooting running water with a slow shutter speed, for example, gives that water surface a silky, sometimes even dream-like appearance. 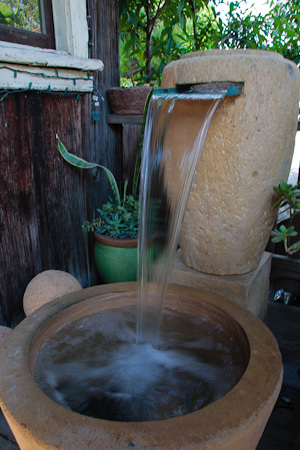 I shot this image of a water fountain at a shutter speed of just 1/8 of a second. See how the splashing at the bottom is smooth instead of sharply defined. When shooting with the shutter speed this low, you will probably want to put your camera on a tripod. While you want some motion blur in the water, you also want the rest of the image to be rock steady. This is one of those situations that explains why you don’t want to crank the ISO setting up too high. If the ISO setting were too high, it might not be possible to slow the shutter speed down enough, even at the smallest aperture, without over-exposure. On the other hand, you might find that you cannot shoot with a fast enough shutter speed to freeze sports action, even with the aperture wide open. This can happen on cloudy days or late in the afternoon. That is when you might want to increase the ISO to 400 or so, even outdoors. It is even possible to combine freezing the action with blurring the action. 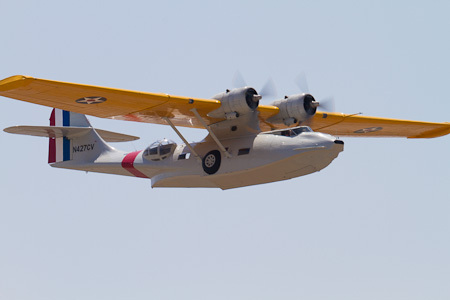 I shot the image below of a vintage World War II PBY Catalina at a shutter speed of around 1/160 of the second. This was fast enough to freeze the forward motion of the plane, but slow enough that the spinning propellers were blurred. Admittedly, the “Cat” isn’t that fast as airplanes go, but it’s still an airplane and it’s still flying fast enough not to fall out of the sky. ISO 100, f/11 @ 1/160 sec. When shooting handheld, you need to be aware of your shutter speed. Below a certain speed, you will need to put your camera on a tripod. How slow you can go depends on the lens you are using, but the rule of thumb is relatively easy. If you are shooting with a 300mm lens, your shutter speed should be 1/300 of a second or faster to shoot handheld. If you have a 50mm lens, you can shoot hand held at 1/50 of a second or faster. In short, take the length of the lens and put “1/” in front of it. Some lenses have letters like “IS,” “VR,” “OS,” or “VC” in the name. These lenses actually adjust for your shaky hands, which allows you to cheat and hand hold your camera at slower shutter speeds. You still need to know the rule of thumb, however, to know how much you can cheat. Now how does this apply to the real world? Aperture Priority, labeled as either “A” or “Av” on the mode dial, lets you control the aperture while the camera picks the right shutter speed. Shutter Priority, labeled as either “S” or “Tv” on the mode dial, lets you control the shutter speed while the camera picks the right aperture. I expect that most of you will spend most of your photographic life in one of those two modes. I will cover camera modes, plus how and when to use them or not use them, in a later article. For now, know that, for example, a wide-open aperture gives a very shallow depth of field, so you can set your camera to Aperture Priority, choose an aperture of f/2.8, and let the camera handle the rest. You should also know that most cameras handle exposure not in full stops of ISO, shutter speed, and aperture, but in one-third or half stops. You can usually select which one. This means that, when selecting aperture in thirds of a stop, it takes three clicks of a wheel to change the aperture one whole stop, say from f/8 to f/11, or to change the shutter speed from 1/100 to 1/200. I have glossed over a lot in this article. Depth of field is a much more complicated subject, and using Aperture or Shutter Priority modes can be more complicated than I make it sound. This article is just supposed to be an introduction to the subject of the exposure triangle. I’ll cover the more practical matters, such as putting it all into practice, in later articles. Hopefully, you have found this helpful.